But some web servers and search engines (like Google) may consider these URLs to be different. Both of the URLs point to the same resource. So, we have two URLs to access one resource. Such a situation causes content duplication and content duplication is a cardinal sin in the eyes of search engines. They put a heavy penalty on websites hosting duplicate content. First of all, you would need to decide which format you prefer. You want to keep your website’s URLs in www format or non www format. Whichever you choose, stick to one format. Do not mix www and non www URL formats. Make sure mod_rewrite module of Apache is available. Modifying .htaccess will require you to have access on your server. If you’re writing a blog on a free platform (like WordPress.com), you would not be able to access or change .htaccess file. But in such a case you would not any way need to make such changes as the blogging platform does take care of such small issues. 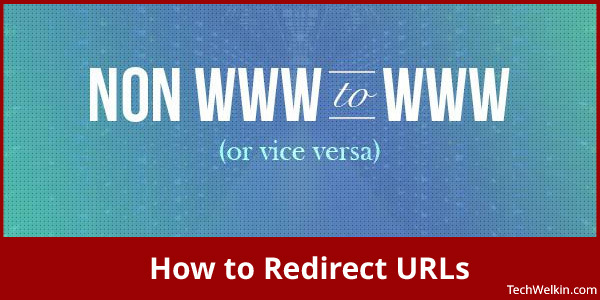 Redirect www to non-www URLs and vice versa using HTACCESS. As you can see, you don’t need to change anything. Just paste the above code in .htaccess and all your www URLs will be permanently redirected to the corresponding non-www URLs. How to redirect an old folder to a new folder name? As I have mentioned, you should try to avoid making changes in the URLs but sometimes it is necessary and unavoidable. In case you have to rename a folder, you should use the following code to redirect URLs with old folder to the new folder. Do not forget to change ‘old’ and ‘new’ with the old and new names of your folder. I hope this information was useful for you. Make sure redirection is done properly. A badly configured .htaccess can break your server. It is an extremely important file. Correct URL redirection will benefit not only your website or blog users; but also it will have a good impact on your website’s search engine optimization (SEO). Should you have any, please feel free to ask any questions. Thank you for using TechWelkin! Great article! I found good and working solution to do 301 from www to non-www thank to you! Thank you. Thanks for this info. I have been facing issues with redirection. This will surely help me out in solving redirection issues on my server. Hi sir i want to know which domain format is important? with www. or without it? can any one please let me know. Both formats are equally ok. There is no practical difference. Is it important to redirect from one to another or vice versa-means www to non www or from non www to with www url? That’s a matter of personal liking. You are the man. I really like your work and guidance to resolve such critical issue. Thanks for detailed explaining things for www vs non-www and also providing htaccess code for the same. Thanks for sharing nice peace of code built for 301 redirect using the .htaccess file, i was looking for the code. You’re welcome Praveen! All the best for your endeavors. Thanks Arsh, I am glad you were able to solve www redirect problem in your website. Stay connected with TechWelkin! How to redirect this for asp.net based website. In case of Windows hosting, most probably you’re using IIS Server (which runs ASP.net code). The HTACCESS does not work on IIS Server. Instead of htaccess, you should use web.config file.